In the February 4th issue of the Kentish Mercury contains a prolonged account of the current position both by George England & Co. and their workers. Whereas the George England account of receiving the deputation of seven “of the most respectable of the workmen” shows George explaining to them how the rules came about and why they are right. There is also a letter from one of those seven (John Bawden) who states “As soon as we entered his office we were informed that we had all made ourselves liable to three months imprisonment for heading a lot of blackguards. After standing for two hours and a half in his presence, he positively refused to comply with the minor portions of our grievance”. England had proposed a committee be set up of the various departments “ one from the smithing department, including hammermen, one from the boiler making department, including assistants one from the fitting department, including assistants, one from the machinery department including assistants and one from the labourers department”, for persons to appeal against the operation of any of the rules. The view of the John Bawden on this was “The deputation did not think the men would continue working, well knowing from past experience the character of Mr England, that should the jury decide against him, they would be discharged at the first opportunity, and further, what workman would feel comfortable in a position where he had to decide against his master? The workmen believing that it is not his place to decide on whom the master shall keep on, or discharge, refused to accept his proposition”. Some interesting light is shed on the departure of John Cleminson, his manager at this difficult time. As a nice touch the current apprentices, gave him” an address and a handsome breakfast and tea service” which was reported in the papers. Another striker, G.Crossman, who signs himself as ‘one of the roughs’! writes “we the roughs are not the only ones tired of his tyrannical proceedings, I wish to inform you that the Foreman and Manager, who have been in their situations some years , have also left his employ”. England & Co. respond “ Mr Cleminson (the late Manager),Mr Miller (the timekeeper)and Mr G.England jun, who were all present , can bear testimony that these remarks (their previous statement) together with our previous statements are all substantially correct. Mr Cleminson, though present, was too unwell to take any part in the discussion, and the allusion to that gentleman resigning his situation, which he has filled with credit for eight or nine years, as in any way sympathy with the movement of the men is totally untrue and a great libel upon him. We are extremely sorry to say that he has been compelled to resign in consequence of long and serious illness under the advice of a very able medical man, whom we ourselves have consulted, respecting him, and we regret to say nothing but a period of rest will restore him to his previous condition.”. Cleminson would go on to be a locomotive inspector by the 1871 census, and to be Locomotive Superintendent of the Iquique and Moria Railway soon after, so in modern parlance he may have been suffering from stress. It is intriguing that George England himself had consulted the same doctor. Two weeks into the strike and the battle lines hardened. George England had also started to lose men to other employers. A general meeting of the men on strike lately employed at the Hatcham Iron Works, New-cross, to the number of 250, was held on Tuesday (7th Feb) evening at the Crown and Anchor Tavern, Old Kent Road, for the purpose of receiving a report from the strike committee. Mr Trumper occupied the chair. Mr Banden, the secretary reported that of nearly 300 men who had struck 100 had obtained employment in other establishments. Not one of those who had struck had gone back to Mr Englands employ, and that gentleman who had been in the North of England for the purpose of obtaining men, had returned unsuccessful, not being able to induce any men to work under his arbitrary rules. The various engineering, boiler-making, and other shops in the iron trade were liberally subscribing in aid of the men on strike, and he hoped the committee would be able to pay a good dividend at the end of the week. The society men out who were receiving strike pay from their various societies had generously relinquished any share in the general subscription in favour of the non-society men who had struck. Mr England had only that morning summoned one of his late workmen before a magistrate at Greenwich Police-court, for breach of contract…but the magistrate…dismissed the summons. Mr England having to pay the costs…the committee said they would test the feeling of the meeting by the following resolution…“That this meeting of Mr Englands late workman declare their determination not to resume work in his establishment until he has modified his arbitrary rules”. This resolution was carried unanimously, amid loud cheering. On Saturday afternoon week (11th Feb) the committee…received a communication from Mr England, to the effect that he had withdrawn his old rules, and that he had caused the following notice to be posted up:-“The whole of the objectionable rules are withdrawn. Every one employed on those works is expected to conduct himself respectably, if he wishes to continue in the employment, G.England”. The committee were also informed that the gates of the factory would be opened at nine o’clock on Monday morning (13th Feb), and those of the workmen willing to resume their employment might do so. In accordance with this notice, about 200 of the men out of 300 who struck (the rest having obtained work at other establishments) presented themselves at the gates at nine o’clock, prepared to resume work, but to their great surprise they were refused admittance. After waiting about for some time a message was brought out from Mr England, and the men were requested to walk in singly and see Mr England. Mr England wished it to be understood that none of those whom he considered to have taken an active part in the strike should work again in the establishment. An general meeting of the men was held, when the extraordinary conduct of Mr England was taken into consideration and it was unanimously resolved that under the circumstances, no man should resume his employment until the gates were thrown open unreservedly to all willing to work, or the intentions of Mr England were more definitely stated. On Wednesday night (15th Feb) at eight o’clock a numerously attended meeting was held at the Crown and Anchor Tavern…to receive a report from the deputation appointed to wait upon Mr England…from the statements of Messrs Bowden, White and Lewis…it appeared that Mr England would only consent to receive each member singly, that he refused to discuss the matter amicably, and that although the most courteous language was used by each of the deputation, Mr England’s demeanour was most angry and excited, so much so that he shook his stick at White and ordered him to leave the premises… it was resolved that as Mr England had refused to come to any reasonable terms the strike should be continued. “Last night. ..a numerously attended meeting of the workmen recently employed by Mr G. England, proprietor of the Hatcham Iron Works, and who have been on strike for 5 weeks, against certain objectionable rules enforced by that gentleman, was held at the Crown and Anchor tavern, New Cross road, to receive a report from a deputation appointed to wait upon Mr England to ascertain if an amicable settlement of the dispute could be arrived at. The chair was occupied by Mr Trumper, who briefly alluded to the objects of the meeting. Mr. Bowden, the secretary, reported that Mr. England having consented to receive as a deputation Mr Allen, the secretary of the Amalgamated Society of Engineers, and Mr.Allen, of the Boiler Makers Society, of the district, an interview had taken place on that day, when a long discussion occurred between the deputation and Mr. England, who acceded to certain conditions for modifying the regulations, &c.
The strike was reported over, on 11th March. He had been forced to give way to their demands and give them the same conditions as were offered to other workers at John Penn & Sons and working for Rennie on railway construction. He had not only lost face, but in that six weeks it is reported, he lost half his workforce to other employers. Therefore the skill base he had worked so long to build up was decimated. In Cleminson, he had lost a capable manager. Report on Engines building for the South Eastern Railway Co. at the works of Messrs G. England & Co. The Workshops of Messrs England and Co. are sufficiently large and their arrangements is such that eight engines and tenders might be in progress of erection at one time. There is accommodation for the required number of fitters and workers for this purpose i.e. fifty to sixty. The number of Engines in cause of erection is four, two of which have not had any work done to them for six months, of the other two, one is approaching completion and will probably be completed about the middle, and the other by the end of June: when if the same number of men are put to the former two engines they may be completed by the end of August or beginning of Sept. The number of workers employed and present is about sixty, there are sometimes more and sometimes less and the men employed in most cases stay but a short time and either leave or are summarily discharged the reason assigned being usually incompetency: The consequence of this course is a continual influx of men, to whom the work is not familiar and little progress is thereby made. For the remainder of the Engines not laid down for erection there is a considerable quantity done which may possibly amount to about 1/3 of the whole. It lists also, the total number of locomotives started as being 20 (Nos 215-234). So the workforce is reduced to a fifth of its previous levels, not a half and George England, without his manager Cleminson, is mismanaging a less skilled workforce. For the South Eastern Railway order the report gave them the insight to back out of the full order and just accept the four locomotives (Nos 215 to 218). These were handsome 2-4-0 locomotives with two 16” x 24” cylinders and 6ft driving wheels. They appeared as below on a letterhead of the time. Though the workers were eventually persuaded back, the strike cost the company dear; an order for 20 locomotives for the South Eastern Railway was cancelled. This consisted of 14 of the ‘Cudworth’ 2-4-0 type plus 6 ‘express’ engines on which work had probably not started at the time. The SER accepted only four of the first 14. Of the remaining ten, two were sold to the Somerset & Dorset Railway, arriving on the line in full SER livery. The S&D paid £3500 each for them which was £1000 more than the SER were supposed to pay! The remaining eight were eventually sold to the Belgian West Flanders Railway, though possibly not until as late as 1868. (Some sources say two were sold to a railway in Italy, with only six going to Belgium). A. R. Bennet, writing in 1907 gave the following opinion, the facts of which, as shown above are not entirely accurate and show his own attitudes to Trade Unions. “Owing to a strike at the works, which disorganised matters for many weeks, delivery could not be affected in the time agreed upon, besides which the company (the SER) found fault with the workmanship of some of the engines which had actually been delivered, with the result that they refused to accept those still on hand. This was a heavy blow for the firm, and one from which they never really recovered. They ultimately succeeded in disposing of all the engines, but at such a sacrifice that, after struggling on for a time, the firm was forced to discontinue business and to close the works. The men, many of whom belonged to Lancashire, and especially to St Helens, and were settled with their families in the neighbourhood of the works, had then bitter cause to regret the strike which had brought about the catastrophe, as very few of them could find employment in London. The locomotive industry in London laboured under sufficient disadvantage without having a trouble of this nature to contend against, especially when, in addition to paying higher wages and higher rates, coal, materials and finished goods all had to be carted. Thus the locomotive – like the shipbuilding industry, was driven out of London by the short-sighted policy of those to whom it spelt bread and butter”. Firstly, many thanks to Chris Jones who has done so much to check out documents and establish the facts about the remarkable Mr England, though a fair bit of speculation still has to be done. 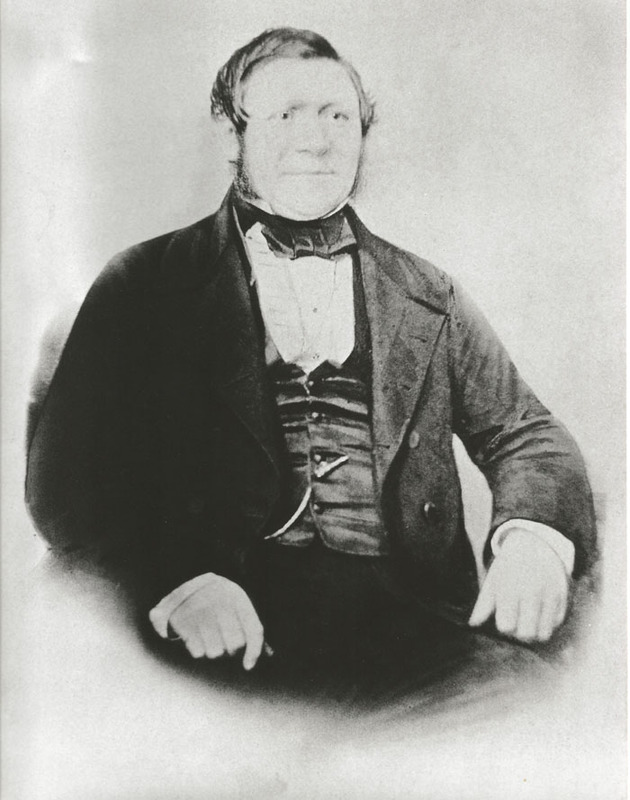 The previously accepted facts were that George England was born in 1811 in Newcastle-Upon-Tyne, and by the age of 14 had moved down to London to begin an engineering apprenticeship with the prestigious John Penn Boiler Works and Shipyards in Deptford who were noted at the time as manufacturers of marine steam engines. It is odd that he moved down to London when there were many shipbuilders and engineers nearer to the place of his birth. However, a gentleman called Henry England lived in South London, and George certainly knew him as he crops up in several references. Perhaps he was an uncle and arranged his apprenticeship, and may even have provided accomodation in the early days? The dictionary of national biography has the birth date of George England as 1811 in Newcastle upon Tyne. On a much later marriage certificate from the 1850s, he says his father was also George England, an engineer. The profession of engineer quoted though, should not be taken at face value. After all, by that later marriage, his father would have died, and George would want to keep up appearances. He was not alone in this, as his later associate Robert Fairlie did exactly the same thing on his marriage certificate, and it can be demonstrated that his father was a blacksmith! So we are looking for a George England who had a son in Newcastle in 1811. The records that remain are sparse but there is one, who was married to a Mary Whinney in 1808. Their son, George England, was born on 8th July 1811. There are records of four other children, Eliza (1809), Isabella (1813), Anne (1814) and Mary (1816). Isabella is an unusual name and important in what follows. Years later in July 1832, the papers are full of the story of a George England, accidentally killing his wife Mary, with their daughter Isabella as a witness. This George England, was an anchor smith and a publican in Swalwell (in the Whickham district of Newcastle upon Tyne). He had a disagreement with his wife and pushed her. She fell backwards and her head hit a broken flagstone, causing her death. His remorse, backed up by his daughter, led him to be convicted only of manslaughter, and he was given a sentence of 3 months imprisonment. Had he been found guilty of murder he wouild have ben hanged. The juxtaposition of a George, Mary and Isabella, so close to Newcastle makes it almost certain that this was the family our George England was born into, although it cannot be absolutely proved. The Newcastle he was born into was a hive of industry, commerce and shipping, and if his father was a metal worker or smith then the young George would have had at least second-hand knowledge and would have had no difficullty in finding work in the engineering or shipbuilding industries. The next statement in his biography is that he was apprenticed to John Penn and Sons in Greenwich at the age of fourteen. This age ties up with the school leaving age of the time. It was certainly the custom in those days to go straight into an apprenticeship. As an example a near contemporary of his, from Newcastle – John Nixon (1815-1899) a famous mining engineer, at 14, went straight into an apprenticeship in Garesfield, west of Newcastle. However, this doesn’t explain how and why he travelled so far from his parents and how such an apprenticeship would be paid for. Chris Jones speculates that he may not have served an apprenticeship at all; he may have left home following a family argument (it is obvious that both he and his father had fierce tempers). Apprenticeships were very expensive, and a strong young man with a basic knowledge of even basic blacksmith work would have found some kind of work easily enough. He could have travelled down to London by boat, there were many cargo and passenger ships running up and down the East Coast and if you had the time and didn't mind a bit of hardship for a few days, the fares were cheap. Even after the railways were established, some travellers preferred to use ships to travel from the North to London, due to the low cost. George may even have worked his passage. Chris has unfortunately been so far unable to establish a family link to Henry England, though the surname suggests they must have been related somehow. If he did work in the shipyards in South East London, and his apprenticeship lasted seven years then that would leave him looking for work around 1832. The first hint we have of him is from his first marriage. He married Jane Dafter from Wiltshire. Her unusual surname helps us identify that this is the right George England being married. The service was carried out in St Clement Dane’s church on 28th July 1834. The record is just before marriage certificates were introduced and so is light on information, informing us that they were both of full age (she was a year younger than he) and that they were living within the parish, which was located in Westminster. George is next mentioned in a court case from January 1838. At this time his wife Jane had a shawl stolen and there are a few paragraphs about the case in the records from the Old Bailey. There were other George Englands at this time in London, but (in checking in the 1841 census, only 3 years later) there were fortunately no others with a wife called Jane. She describes herself as his wife and gives her address as Edgeware Road. There is the hint that things are not well in their marriage. She went to spend Christmas 1837 with friends in Greenwich rather than with her husband. We finally find George for the first time directly, in 1839. He appears in Pigots Directory and his address is 27, Gloucester Terrace, Vauxhall Bridge Road, near the current position of ( the much later) Victoria Station. He gives his profession as Smith. Also on 30th April 1839 he appears in the minutes of the London and Southampton Railway as being paid for the supply of tools. The marriage was not a success and he left Jane to live with a lady called Sarah Hannar, the same age as himself, with whom he went on to have three children, Mary, born 1841, Eliza Anne, born 1843, George Junior born in 1844. When his first wife died, he married Sarah. The 1861 census shows her as his wife by then. By 1839, England had begun renting a vacant factory building on a piece of land between Pomeroy Street and Kender Street, just off the Old Kent Road, in the then semi-rural district of Hatcham, now better known as New Cross. The premises consisted of a cottage, where the family lived, and a manufactory and had initially been used by one Henry Duxbury, who was involved in the leather trade. George patented (No. 8058, registered 7th May 1839) for a design of screw jack and on the 2nd March 1841 took out patent No. 8860 for a machine for weaving woollens. These inventions made him successful enough to be able to purchase the factory, which he renamed The Hatcham Iron Works. He lived with his family in the cottage attached to the premises which he also bought. Though records show that he first paid rates on the property in July 1840, it is not until the 1846 edition of the Post Office Directories that he is listed as ‘England, George & Co. Engineers and patent screw jack manufacturers, Hatcham Iron Works, Old Kent Road’. He was already interested in railway engineering, having sold tools to the London & Southampton Railway in 1839 and in 1843 had tried out his ‘manumotive railway carriage’ on the London & Croydon Railway. "No further references to the firm appear in the Kentish Mercury until 8th November 1858, when Mr George England was charged with "unlawfully assaulting and baeting his apprentice, George Effingham Pattie on the 2nd instant." England's defence was that the apprentice had stolen or removed some spanners belonging to his, England's son who had been articled to the firm in that same year. (A dinner and dance was given to all hands to celebrate this occassion). England futher alleged that it was not the first time this had happened , the apprentice also pointing out that it was not the first time he had been beaten either. The magistrate gave his decision as "fine 5 shillings and costs or 7 days imprisonment", adding, as a rider, that the defendant "had beenrather too free with his correction." The fine was duly paid England remarking, in doing so that the magistrate would soon have to adjudicate again, as it was now begun." By 1861, a frequent visitor to Hatcham Lodge was Robert Francis Fairlie, an engineer who had been born in Glasgow 1831, himself the son of an engineer. He trained at Crewe and Swindon the works of the London & North Western Railway and of the Great Western Railway respectively, both of whom regarded themselves as the finest railways in Britain. He had begun his professional career in 1853 as the locomotive superintendent to the Londonderry and Coleraine Railway, later working in India for the Bombay and Baroda Railway (for whom England had built six locomotives in 1859, though four of them were lost at sea during transit). Fairlie had returned to London by the end of the decade and was working as a consultant engineer. Though no doubt much of the talk between England and Fairlie was of engineering matters, Robert also paid a great deal of attention to Miss Eliza Anne England, affectionately known as Lizzie. At seventeen, George thought Lizzie a little young to be seriously courting, and he asked Fairlie to wait for a couple of years before pursuing her. He agreed to do this, but in January 1862 Lizzie and her sister went to the Crystal Palace for the day. Only Mary returned and by the time George and Sarah found out that the couple had eloped, having gained a licence to marry after Fairlie signed an affidavit to say he had her father’s permission, they were well on their way on the Boat Train. When the couple returned from their honeymoon in Spain, George took Fairlie to court for perjury. The resulting Central Criminal Court case, reported in The Times of 8 April 1862, caused much public interest. Under cross-examination by Sergeant Ballantyne (who appeared for Fairlie), England was forced to admit that he had run away with his present wife(Sarah Hannar), the mother of Eliza, and that he had a wife living at that time. He had lived with this lady many years but could not marry her until his wife died. By a quirk of English law, at that time, a child born out of wedlock was considered nobody’s child. In law she was nothing to do with England and could marry whom she pleased. There was no case to answer and therefore a verdict of not guilty was returned. England was furious, declaring that Lizzie, who had no money in her own right, “would not get a farthing from him”. The family were quickly reconciled, (possibly when the first grandchild appeared!) and Fairlie gradually became involved in England's work. The case was widely reported in the press, and George’s reputation and social standing were undoubtedly damaged by the revelations. Since 1857, England had been one of the ten directors of the Crystal Palace Company. There had been a certain degree of incompetence and corruption involved in the project, particularly involving one William Robson, who defrauded the company of £28000 by maintaining a false record of shareholders. He was the registrar and used the money to ‘satisfy his strong desires and vitiated tastes including gambling and women’. He supported a wife and two mistresses with money he claimed to have made on the stock market. He was sentenced to 20 years transportation. At one stormy meeting England made many complaints against the chairman and mentioned several cases of goods being supplied to the company at what he considered to be exorbitant prices. Having had his say, he then resigned, despite a vote taken at an ordinary general meeting of the shareholders, begging him to stay in office. By the time the 1861 census took place, both Hatcham Lodge and Georgina Terrace had been in use for three years. The page I have shows the inhabitants of Hatcham Lodge and Nos. 75-8 Georgina Terrace. They are hand wrtitten and sometimes difficult to decipher. 74 Kender Street "Hatcham Lodge" . George England is head of the family, Married, 49 years old, Engineer and Proprieter of Factory, born in Newcastle-upon-Tyne, Numrthumberland. Sarah England is his wife, 49 years old, born in Lowestoft, Suffolk. There are three servants, all unmarried; Emma King, Cook (Domestic), 35, born in Stroud, Gloucestershire. Sarah Hubford, Housemaid, 24, born in Bermondsey, London, and John Blewsell (?) 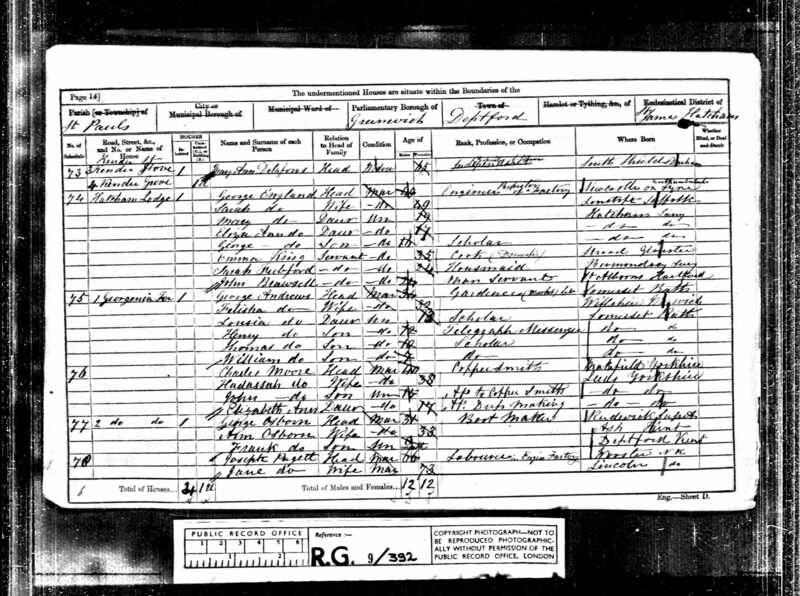 Man Servant, 24, place of birth illegible. Though England is supposd to have built the houses in Georgina Terrace for the benefit of his workers, they do not always seem to be occupied by men employed by him. 75 Kender Street; 1 Georgina Terrace is occupied by George Andrews, a market gardener, his wife and five children, one, a boy of 12, being a Telegraph Messenger. 78 Kender Street ? 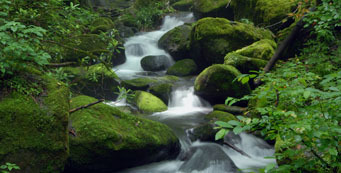 is occupied by Joseph Pugett and his wife Jane, 66 and 73 respectively. He is listed as "Labourer in Engine Factory"
"Bridges Adams, who was an artist and a gentleman, George England, who was an industrialist and no gentleman, and James Samuel, who was of the contemporary Eastern Counties brand of locomotive engineer, were all running the 'light locomotive' at this time (1850). It was to be expected that one of the less gentlemany would try to cash in on the strife between the Edinburgh & Glasgow and the Caledonian Railway companies, and it happened to be George England." "George England was very proud of his little engine ("Little England"), which was taken to provide the design for his letter headings for several years. The firm fell on eveil days in the 'sixties, chiefly through an engineering strike which cost it some important contracts, and led to its winding up. Sir Wiliam Hardman recorded some pungent incidental scandals; that England was much involved with the Crystal Palace, made enemies in connection therewith, and was attacked on moral grounds because he prosecuted for perjury the interesting Mr Fairlie, who had eloped with an illegitimate daughter of his. Fairlie was aquitted and England's swan-song seems to have been building the Fairlie patent locomotive Little Wonder for the Festiniog Railway. A quaint business, truly!" C Hamilton Ellis "The North British Railway" Ian Allan 2nd Edition 1959 p.50 et seq.